Senior distance swimmer John Tepper competing in an event earlier this year. Photo courtesy of Sports Information. Fast and furious isn’t just the title of an overly drawn-out movie franchise. 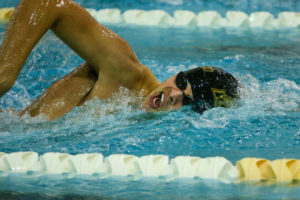 It’s a way to describe how the Rowan men’s swimming and diving team began their competition at the WPI Gompei Invitational this past weekend. The team won the 800 freestyle with a time of 6:53.50, senior John Tepper won the 1650 freestyle and freshman Kevin Gillooly won the 50 free with a time of 21.13, which stands as the top time for the team in the event for the year. Senior Colin Fisher finished third in the 200 individual medley, while freshman Dylan Regan and junior captain Eric Feuerstein tied for third in the 50 freestyle. 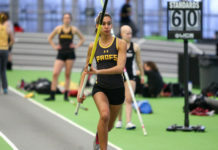 A big key that has been working for the Profs’ success has been the performances of the underclassmen, who did their job throughout the meet to keep the team in contention and secure the top spot. 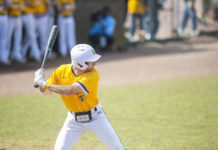 Although they were able to come out with a first place finish over the weekend, the team is still not 100 percent “there yet.” The Profs are still missing a couple key parts and are trying to put all of their skills together to be anywhere near the level of competition they were at last season. There’s no shortage of practice for the team with finals week on deck and the semester coming to an end for an almost month break. When asked about his plans for the team, Bowser had one word to describe them. The team comes back to train the first week of January before hosting Montclair State University on Saturday, Jan. 13.